Thinking about investing in a new fire pit? Doing so will open up the doors to a whole new world of opportunities for you and your family. Using a fire pit, you can create a relaxing ambiance on your patio, grill burgers and hot dogs (or any food for that matter), or just use your fire pit to enhance your home’s exterior. To take full advantage of this brilliant accessory, however, you’ll need to know how to light it. The easiest and safest way to light your fire pit is to place a ball of kindling under the wood. Kindling can be any light, fluffy material that easily catches fire. Newspaper, dead leaves, pine needles, wood shavings and small pieces of tree bark are all excellent sources of kindling. Place a small stack under the wood in your fire pit and try lighting it instead of the wood. Once the kindling catches fire, the rest of the wood should also ignite. Generally kindling won’t light large logs on fire before burning out. Because of this it’s typically best to have a layer of smaller diameter wood between the kindling and logs. Larger twigs, broken tree branches & chopped up logs work great for this purpose. It’s best to avoid using gasoline to light your fire pit for a couple different reasons. First and foremost, gasoline is highly combustible, meaning there’s a greater risk of an explosion and/or uncontrollable fire when using it in this manner. Secondly, gasoline has a petrochemical odor that lingers in the air. If you intend to cook on your fire pit, this chemical-rich smell will taint your food — something that most people want to avoid when cooking. Why Isn’t My Fire Pit Lighting? If you are still having trouble lighting your fire pit, you should check to make sure the lumber is dry. Conventional wisdom should leave you to believe that lumber won’t light if it’s still wet. This is why it’s important to always store your lumber in a dry, covered area; otherwise, it will become saturated with moisture when it rains. Lumber will typically dry out in a couple days, but until then, you may struggle to light it. There’s no better way to enhance the aesthetics of your patio or outdoor living area than by adding an S&S Fire Pit. Manufactured from professional-grade steel, they are designed to last a lifetime. In addition to creating a relaxing atmospheric mood, however, fire pits can also be used for cooking and creating warmth. Regardless of how you use it, you’ll need plenty of firewood on hand to keep the fire blazing. We’ve talked about this before on our blog, but it’s worth mentioning again the best firewood is going to be what is local to your area. Here in Georgia, Oak, Hickory and Pine are native, but we don’t recommend burning pine at all. Oak and Hickory are best for us. The best wood to obtain is always properly seasoned. If you can find kiln dried wood that is even better because it burns hot and with very little smoke. In addition to using the right type of wood, though, you’ll also need to store it in a proper area. Leaving your firewood on the ground is just asking for trouble, as moisture will escape from the soil, causing the wood to rot. Furthermore, leaving firewood directly on the ground increases the risk of pest infestations such as termites. Instead of placing your firewood directly on the ground, try storing it a couple inches off the ground using a wooden palette (or several). As long as there’s a barrier of protection between your firewood and the ground, it will remain protected from ground moisture and pests. You’ll also want to keep your firewood covered. Allowing rain to fall on your firewood is just asking for trouble. It doesn’t take long for moisture to seep into the pores, causing the firewood to rot from the inside out. A simple solution to covering firewood is to use a tarp. Most home improvement stores sell plastic tarps for as little as $20 bucks, which is a small price to pay to keep your firewood nice and dry. These are just a few tips on how to store firewood for a fire pit. Of course, it’s also a good idea to keep the firewood near your fire pit so you aren’t forced to walk long distances to retrieve it. If you have to walk across the yard just to retrieve a couple pieces, you may find yourself using your fire pit less often. So, you’ve made the decision to invest in a fire pit for your family and now you’re faced with the task of trying to find the right location for it. There are dozens of different places where fire pits can be used, but you’ll want to consider the following when choosing a location for it. Consider the seating options when choosing a location for your fire pit. If you have a garden area with fixed stone benches, then perhaps you should set it up here. Doing so will create a social environment in which friends and family members can gather around your new fire pit. Even if you don’t have fixed seating, however, you may want to choose a location for your fire pit that’s large enough to accommodate your preferred seating. Of course, you’ll need to choose a location that’s away from trees, overhanging branches, and wooden structures that could otherwise spark a fire. Stray embers are bound to occur anytime you make a fire, which is why it’s important to choose a safe and appropriate location for your fire pit. A good rule of thumb is to give yourself a minimum of 7 feet of clearance space around your fire pit. If you aren’t sure if your fire pit has enough clearance, don’t just “eyeball” it, rather take a measuring tape to see if it’s at least 7 feet. If it’s under this amount, you’ll need to move your fire pit to a new location to reduce the risk of fire damage to your property. Something else to consider when choosing a location for your fire pit is the distance to fuel. Most people prefer to use seasoned firewood. So, if you have a stack of firewood in your yard, you may want to set up your fire pit close this area — or at least within a reasonable walking distance or purchase a firewood rack which can be placed close to your fire pit. This will make the process of retrieving firewood just a little easier. Of course, if you choose a S&S Fire Pit, you’ll have the freedom to move it around between different locations. If you grow tired of using it on your patio or deck, for instance, just pick it up and carry it elsewhere. S&S Fire Pits are completely portable, offering an unmatched level of versatility. Fire pits have a tendency to attract people, making them the perfect focal point for outdoor parties, cookouts and social gatherings. Regardless of the season or time of year, you can always count on a fire pit to create the perfect social environment. But anytime there’s a gathering of people, adequate seating must be provided; otherwise, guests will be forced to stand, which could be become tiresome for some individuals. So, what’s the best type of seating to use in conjunction with a fire pit? Let me first start off by saying that there is no single “best” type of seating for a fire pit. Everyone has their own personal preference for seating, which is why it’s important to weigh your different options. With that said, benches are an excellent choice for large gatherings. If you enjoy having half a dozen or more friends over for a social gathering around the fire pit, perhaps a couple of strategically placed benches will work. It’s a quick and easy seating solution that most people will enjoy. And best of all, they allow couples to huddle together. If you are looking for a more relaxed, laid back style of seating, consider the Adirondack chairs. Name after the Adirondack mountains from which it originated, this unique chair is characterized by long armrests with a reclined back. Some people may find the Adirondack chair to lean back too far, but for others it’s just right. In any case, this is a popular and ultra-comfortable seating option for fire pits that shouldn’t be overlooked. The chaise lounge chair is another excellent choice of seating for a fire pit. Featuring an upholstered sofa-chair, it’s long enough to provide ample support for your legs. So when the sun goes down and you’re looking to relax by the fire, you can kick back on a chaise lounge. Much like the Adirondack chair, however, chaise lounges will keep you at a farther distance away from the fire — something that you may want to avoid. Regardless of which chairs or seating you choose, there are a few things to keep in mind. First and foremost, make sure it’s waterproof. Some materials may not be suitable for long-term use outdoors, causing them to develop mold, mildew or even rot. Secondly, make sure your fire pit seating is comfortable. I know this probably sounds like common sense, but you would be surprised to learn just how many people choose style over comfort, only to rarely or never use their chairs. A fire pit makes the perfect addition to any patio, deck or backyard. It can be used for roasting marshmallows, telling campfire stories, producing warmth, cooking meals, or just creating a relaxing ambiance. But if you really want to reap the benefits of owning a fire pit, you should consider investing in the right accessories. There are dozens of different accessories available for fire pits, some of which include the following. What in the world is a snuffer and why should you buy one? This convenient little accessory will allow you to put out your fire pit in just minutes. Instead of waiting an hour or longer for the flames to die, you can simply place the snuffer on top. Within ten minutes, the fire pit should be extinguished, giving you peace of mind knowing that a stray ember isn’t going to escape and spark a fire. Snuffers are inexpensive and easy to use, making them well worth the minimal investment. In addition to a snuffer, you should also consider buying an outdoor tabletop. While fire pits can be used directly on the ground, it’s easier and more convenient to use them at about waist-height. This eliminates the need for bending over, as you can access the fire pit in front of you. You can simply place your fire pit directly on the tabletop, using it like a traditional outdoor table. When choosing an outdoor tabletop for a fire pit, check to see what material is it made of and whether or not it’s suitable for high heat. Everyone should cook on their fire pit. It’s a great way for everyone to watch you cook and become part of the fun. Rib eye, oysters, burgers, hotdogs, pizza, chicken, sausage etc. Get a cooking grate, it’s a great addition to your fire pit. Another fun accessory that’s perfect for fire pits is marshmallow and hotdog forks. Featuring a long, pronged fork, they can be used for cooking and roasting all kinds of foods, only two of which are marshmallows and hotdogs. And with Independence Day fast approaching, you’ll probably be cooking plenty of hotdogs, so don’t miss this accessory for your fire pit. S&S Fire Pits Make the Perfect Gift! Can’t seem to find the perfect gift for a friend, family member or that special someone in your life? Sure, it’s probably easier to pick up a gift card, but generic gifts such as this lack any real meaning or thought. If you want to leave a lasting, positive impression, you should put forth the effort to choose a more meaningful gift — and there’s no better choice than a genuine S&S Fire Pit. S&S Fire Pits are an ideal gift for just about anyone, and for any occasion. Gift cards are typically used once, at which point they are forgotten about. But just think about how many times a fire pit will be used. It’s not uncommon for individuals and families to use their fire pits for years. And each time they use it, they’ll remember who gave it to them. I guess you could say an S&S Fire Pit is the gift that keeps on giving. An S&S Fire Pit is more than than just a decorative outdoor accessory; it’s a fully functional fire pit that will open the doors to a whole new world of possibilities for the recipient. It can be used for building fires and generating warmth during the cool fall and winter months. Families can huddle around an S&S Fire Pit during the summer evenings to roast marshmallows. S&S Fire Pits are also perfect for discouraging mosquitoes and bugs, as burning certain types of lumber will create smoke that naturally deters insects. Even with all of the benefits, it’s worth noting that S&S Fire Pits are made to last. Other fire pit manufacturers use cheap materials and low-quality craftsmanship in their products to cut costs and save money, which often results in them corroding and rusting just months later. By purchasing, and giving, an S&S Fire Pit, however, you can rest assured knowing that it’s built to last. All S&S Fire Pits are made here in the United States, using professional-grade steel along with the highest level of craftsmanship possible. Outdoor living isn’t just another buzzword; it’s a growing trend among homeowners and families in the United States. And with the spring season officially here, more and more people are turning off the TV and going outdoors to enjoy the beautiful sunshine and warm weather. Of course, there are dozens of different ways to enjoy your outdoor living space. Instead of viewing your lawn as nothing more than grass and trees, think of it as an extension of your home. This environment can be transformed into a brilliant, fully functional area where you, your family and friends can gather for entertainment for activities. For instance, you could set up a fire pit on your back deck or lawn to gather around in the evening. Fire pits offer the perfect combination of aesthetics and utility; they can be used for cooking, warmth, or just to create a relaxing ambiance. In addition to using a fire pit, however, there are other ways to enhance the outdoor living space surrounding your home. According to Michelle Snyder of the American Society of Interior Designers, many homeowners are now installing kitchens with brick pizza ovens and even living rooms outdoors. This is a complete transformation of the traditional patio, allowing homeowners to fully utilize their outdoor living space in the most efficient manner possible. Why are so many homeowners interested in the outdoor living trend? Well, there are numerous factors at play, including a growing interest in health and well-being. As we learn more about the dangers of living a sedentary lifestyle, individuals are taking a proactive approach towards their health by spending more time outdoors. Instead of watching TV or playing videos, they are choosing to get outdoors and enjoy the fresh air. Outdoor living may also provide benefits in terms of home value. Installing a fire pit, setting up outdoor furniture, and performing other enhancements to your home’s exterior can increase its selling value. So when you decide that it’s time to move, you’ll reap the benefits of a higher asking price. This is a question that many homeowners ask. Purchasing a fire pit will open up a whole new world of social activities for you and your family, from roasting marshmallows to watching the sunset around a toasty fire. Being that wood burns when exposed to high enough heat, however, you might be wondering if it’s safe to use a fire pit on your wooden deck. It’s true that wood DOES burn when exposed to heat. According to the Argonne National Laboratory, dry wood (not artificial) burns at approximately 451 degrees Fahrenheit. But the good news is that you can still use an S&S Fire Pit on your wooden deck without fear of it burning your deck, although you’ll want to take a few precautions to protect the wood. Before using a fire pit on your deck, you should fire place some type of “base” layer down. Doing so will create a barrier of protection between the fire pit, which of course will become hot, and your deck. One of the great things about S&S Fire Pits is that they are elevated high enough so the bottom of the bowl isn’t close to the ground. By keeping the base elevated, the heat remains away from the deck/ground; thus, reducing the risk of an accidental fire. Nonetheless, when it comes to fire, it’s best to err on the side of caution by taking additional measures to prevent fires. There are several different types of base layers that can be used on a wooden deck, one of which is a layer of stone. Head to your local home improvement or gardening store to pick up some stone pavers. Once you’ve installed them on your patio, you can safely use your new fire pit without fear of it sparking a fire. The stove pavers will absorb the heat, protecting the wooden materials underneath. In addition to using a base layer on your patio, you may also want to invest in a snuffer. When you are finished using your fire pit, you can place the snuffer over it to extinguish the fire. Within just 10 minutes, the snuffer should completely extinguish the fire, allowing it too cool down. And when the fire pit is cool, there’s a lower risk of it burning nearby materials. From grilling burgers and hot dogs to roasting marshmallows and gathering around the fire for storytelling, owning a fire pit will open the doors to a whole new world of family-friendly activities. But with this fun and versatile accessory comes the responsibility of teaching children the basics of fire safety. Being that they are used to burn wood and coal, fire pits can produce some pretty high temperatures. It’s not uncommon for a fire pit to exceed 700 degrees Fahrenheit, which is more than enough to cause burns. To prevent injury and encourage responsible use, parents should teach their children to respect fire. Children are curious by nature and will often touch new things in their environment. Explain to your child that fires can be dangerous, and that they should stay at least several feet away from an open fire at all times. Children may assume that it’s okay to touch a fire pit after the flame has died down. Even if there is no visible flame, however, the actual fire pit may still radiate enough heat to cause a serious burn. So if you’re a parent, warn your child about the dangers of touching a recently lit fire pit. You can even conduct a hands-on demonstration by pouring just a couple droplets of water on the fire pit, which should cause it to simmer and evaporate if it’s still hot. If a child notices his or her parent adding wood to a fire pit, they may assume that it’s okay to place other items inside the fire pit. But adding foreign objects to a fire pit is a serious safety hazard that will increase the risk of injury. Tell your children to avoid placing foreign objects and items inside a fire pit — or any fire for that matter. Rather than prohibiting your child from seeing and experiencing the fire pit, ask them to participate. Some parents may shield their children, assuming it will protect them from injury. In doing so, however, they spark curiosity, which only drives the child to seek out fire pits without the supervision of their parents. If you’re planning a fire one evening, ask your child to participate by gathering wood and observing as you light it. Over time, your child will become accustomed to the process of lighting and using a fire pit. There’s something mystical associated with fires that draws us to them. Whether it’s a bonfire on the beach or a fire pit on the patio, people who are nearby will almost certain flock towards the burning flame. Even back in the prehistoric days, cavemen and women would gather around fires, both for the purpose of cooking as well as social interaction. So, what exactly attracts us as humans to fires? This is a question that researchers continue to debate. However, one possible theory is that it’s in our evolutionary DNA. A study published in the journal Evolutionary Psychology suggests that modern-day humans have evolved over time to develop a relaxing response to fires. The study found that people become calmer, more relaxed, and more sociable when gathering around a fire. Christopher Lynn, professor at the University of Alabama said that prehistoric cavemen and women would gather around campfires to make friends; thus, giving them a survival advantage in this otherwise unforgiving time. Feeling stressed? Well, you aren’t alone. According to StatisticsBrain, 77% of adults in the United States experience physical symptoms as a result of stress. These symptoms may include high blood pressure, insomnia, increased sweating, nausea and fatigue. The good news is that social interaction, such as gathering around a fire pit with your friends or family, can lower stress levels — all without the use of drugs. By gathering around a fire with other people, you’ll experience an innate sense of relaxation, lowering your stress levels while improving your mood. 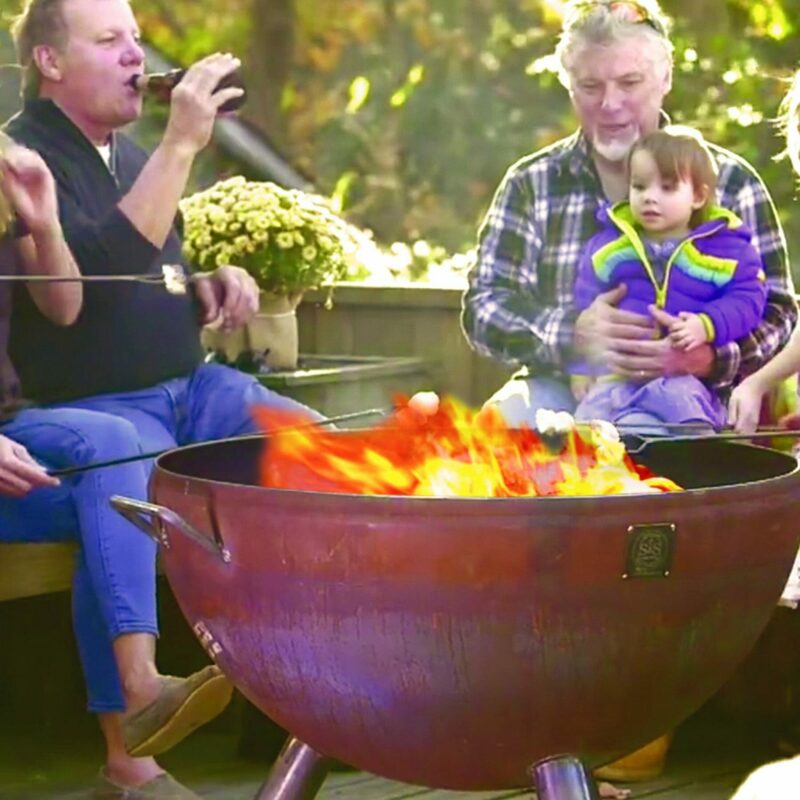 Owning a fire pit may not prolong your lifespan, but studies have shown that people with strong social connections tend to live longer, happier lives. Furthermore, stress has been linked to a wide range of adverse illnesses and conditions. Gathering around a fire pit will promote greater social engagement while lowering your stress levels. It’s often difficult to plan social events with friends and family. However, gathering around a fire pit is a fun, easy and inexpensive activity that people of all ages and backgrounds can enjoy. Instead of sitting around the television and watching a movie, you and your friends can gather on the patio for an evening fire. Unlike watching the TV, gathering around a fire pit will allow you and your friends to converse amongst one another. Purchasing a fire pit for your home is a smart investment that will pay off in more ways than just one. It can turn an otherwise dull and generic patio into a functional and entertaining outdoor living area, allowing you and your family to enjoy this extension of your home. But you might be surprised to learn that fire pits can even add value to your home; here’s how. Ask any professional real state agent and he or she will likely agree: there’s a growing trend surrounding outdoor living areas. With more and more people taking a proactive approach towards their health, families are spending less time indoors and more time outdoors. As a result, homes featuring developed outdoor living spaces complete with fire pits and other accessories tend to have a higher resale value. So, just how much monetary value will an outdoor living area add to your home? It really depends on a variety of different factors, although you can expect it to increase your home’s value by 15-40% on average. You might be wondering how something as simple as a fire pit can add value to your home. Well, fire pits can be used for a variety of different things, such as cooking/grilling, creating warmth on a chilly winter night, warding away pesky mosquitoes and bugs, or just creating a relaxing ambiance. The sheer versatility offered by these accessories make them an attractive addition to any home. Let’s face it, most homeowners neglect their patios and outdoor spaces, leaving them bland and without any real sense of style or decor. Placing a fire pit here, however, will enhance the area so it’s more appealing. The presence of a metallic stainless steel fire pit adds a modern-rustic element to outdoor areas that’s not found in other items or decorative accessories. Of course, a fire pit is just one component of an attractive and functional outdoor living space. Feel free to experiment with other items to see what works and what doesn’t. Featuring American-made steel that’s roughly ¼ inch thick, S&S Fire Pits offer a lifetime of enjoyment for you and your family. Whether it’s for warmth, cooking, or just to create a relaxing atmosphere on your patio, it will enhance your outdoor living space for countless years to come. Like most outdoor accessories, though, fire pits require some occasional maintenance to preserve their appearance and continue functioning as intended. When wood ash is left to sit for long periods of time, it will transform into a highly corrosive chemical substance known as lye (sodium hydroxide). Lye is used in a variety of applications, from food preparation and water treatment to soap and detergent-making. The problem with lye, however, is that it can eat through certain types of metal. While steel is typically protected from this chemical reaction, it’s still recommended that you clean out the ashes from your fire pit on a regular basis. Allowing ash to accumulate will only lead to further buildups of lye, while also restricting the flow of air when new fires are created. Another reason why ashes should be removed from fire pits is to allow for proper water drainage. If there’s a significant amount of ash “caked” onto the bottom of your fire pit, it may prevent water from draining. This will lead to a pool of dirty ash-like water — something that most owners want to avoid. Being that S&S Fire Pits are made of ¼ inch thick steel, rust and corrosion isn’t a problem, but it’s proper water drainage is still critical to maintaining a clean and functional fire pit. So, what’s the best way to remove ashes from a fire pit? The easiest way is to scoop it out using an ash shovel. These small handheld tools are intended specifically for the removal of ash. Just scoop out the ash from the bottom of your fire pit and you are good to go! It’s recommended that you remove the ashes from your fire pit after each use, as this prevents buildups of ash while ensuring proper airflow and water drainage. The cooking grate on a fire pit should be cleaned in a similar manner as a grill grate. Using a wire brush, scrub off any stubborn food particles that are stuck on the grate. You can also spray it with vegetable or cooking oil to help season it. Aside from cleaning the grate and removing ash, however, that’s just about all it takes to maintain a fire pit! It’s a common assumption that all fire pits are permanent and cannot be easily moved. While there are plenty fire pits that fall under this category, there are also lighter, more portable models available. If you’re struggling to choose between a portable or permanent fire pit, here are some things to consider. If you enjoy tailgating as much as the next guy, you’ll want to choose a portable fire pit. You can easily load it on your truck (or even inside a car) to create the ultimate fan-made outdoor experience in the venue’s parking lot. A portable fire pit will allow you to tailgate in style, providing warmth, ambiance, and even functional benefits such as the ability to grill burgers and hot dogs. Be warned, though, the sight of glowing, radiant fire pit will likely attract other fans, so bring extra food! Ask any serious outdoorsman and he’ll probably agree: no camping trip is complete without a fire. Portable fire pits can be used for camping — something that’s not available with permanent fire pits. Their small, compact design allows campers to easily transport them. Upon reaching your campsite, you can use the fire pit to cook food, create warmth, and even ward off pesky insects. Furthermore, using a fire pit instead of building a traditional campfire will reduce the risk of a forest fire. The fire will be contained within the pit, preventing stray embers from setting ablaze nearby brush. When you are finished camping, pour some water over the ashes, dump them into a small dirt-filled hole, and you are good to go! Even if you have no immediate plans to relocate, you probably will at some point in time. The U.S. Census Bureau estimates that the average American will move more than eleven and a half times during their life. When it’s time to move, you’ll probably want to take all of your belongings, including your fire pit. Due to their awkward shape and heavy weight, however, most stone fire pits cannot be easily moved. But if you choose a portable fire pit, such as those offered here at S&S Fire Pits, you can easily take it with you to your new home. These are just a few of the many distinguishable differences between portable and permanent fire pits. Steel vs Stone Fire Pits: Which is Best? Congratulations on your decision to purchase a fire pit. It’s a brilliant addition to any patio or outdoor living area, enhancing the surrounding environment with both aesthetic and functional benefits. While there are many different types of fire pits, the two most popular are stone and steel. So, which type is the best? Ever notice that when sitting around a stone Fire Pit, for example, at an outdoor restaurant, that everyone is huddled or even sitting on the edge of the Fire Pit ? Well, the reason is plain and simple. Stone just doesn’t heat up very well nor does it radiate heat like a true steel fire pit will. Because they are made of metal, steel fire pits are able to absorb and radiate heat more effectively than their stone counterpart. This means you’ll receive more warmth when gathered around a steel fire pit. Steel fire pits will continue to radiate heat long after the wood or charcoal has finished burning. Stone fire pits simply are just not portable. They become a fixture in your outdoor space which after paying for you can’t take it with you. If you want to move it to a new location — or take it with you when you move into a new home you can’t — opting for a steel fire pit is probably the better choice. Steel pits are very portable allowing owners to take them when they move, go camping or just take to a friends house for a party. When discussing the nuances of steel and stone fire pits, we must look at installation and setup. A genuine stone fire pit often requires professional installation, further increasing its bottom-line price. Hiring a professional landscaping company to build and install a stone fire pit isn’t cheap by any means, adding at least several hundred dollars to its cost. Steel fire pits, on the other hand, are already crafted and ready to go without the need for professional installation. As you can see, steel fire pits come out on top as the undisputed winner. Sure, stone has been used for centuries to create fully functional fire pits, and even today they remain a popular outdoor accessory among homeowners. However, there’s a growing trend towards the use of steel fire pits, and for good reason: they absorb and retain heat more effectively; they are portable; they are easier to install; and they tend to cost less. 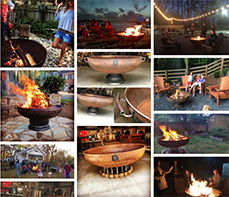 These are just a few of the many reasons why steel fire pits are taking over.